NASA’s flight engineer Anne McClain and Canadian astronaut David Saint-Jacques carried out a six-hour excursion yesterday. Their job was to help replace a faulty solar array battery that was installed during an earlier mission. However, eagle-eyed viewers watching the live stream from home were distracted before the Spacewalk, when they noticed a number of bizarre anomalies, sparking a conspiracy theory. Just hours before Ms McClain and Mr Saint-Jacques were scheduled to walk outside the ISS, something bizarre happened. A small, white object appeared to make its way from Earth up into the night sky, travelling from left to right. Then, just before it went out of shot, a second anomaly appeared from the top of the screen and headed back in the other way, before appearing to disappear altogether. The incident was captured by conspiracy theorist Will Ease, who quickly shared the footage on YouTube, wildly claiming it was proof of UFOs. However, despite the strange sighting, NASA’s mission went ahead without any interference. Using the station’s robot arm, the flight controllers successfully removed the suspect battery and then re-installed one of the recently removed nickel-hydrogen batteries. Ms McClain tightened up the bolts holding the battery discharge unit in place before, along with Mr Saint-Jacques, she removed an adapter plate installed during the first spacewalk. This was to make room for the installation of a second nickel-hydrogen battery that flight controllers will be able to access with the robot arm in future. This is the third Spacewalk mission in three weeks. Strangely, they have all been at the centre of controversy. On March 15, the Soyuz spacecraft successfully reached the ISS. 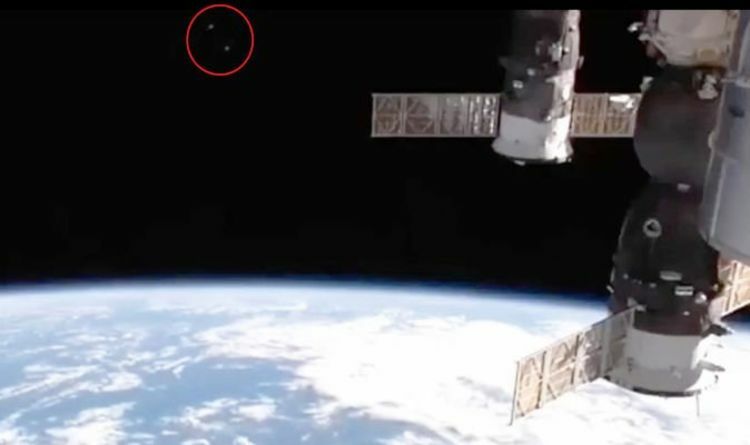 However, three days before, an unidentified object was seen flying below the space station. After that, on March 29, Christina Koch and Anne McClain were scheduled to perform the first all-female spacewalk together on the ISS. NASA cancelled the plan last minute though, due to a lack of spacesuits of the right sizes, replacing Ms McClain with Nick Hague, in a move that sparked controversy. However, that was not the last of the issues. The mission was interrupted when something bizarre appeared behind Mr Hague as he worked on the space station. Footage was shared on popular conspiracy channel Secureteam10, where presenter Tyler Glockner wildly claimed he thought it could be a UFO. He said: “This is yet another example of NASA cutting the live feed after a UFO was spotted while one of the astronauts is out doing their spacewalk. “You’ll notice for the good portion of the video there is no UFO. “The UFO appears just above the Earth’s horizon line and I want you guys to notice that up until the UFO appears, the video feed is pretty stable.